BishopBlog: What's in a name? In a recent blog post in the Guardian, Maxine Frances Roper discussed how her dyspraxia made it hard for her to get a job. She had major problems with maths and poor physical co-ordination and was concerned that employers were reluctant to make accommodations for these. The comments that followed the blog fell mostly in one of two categories: a) people who described their own (or their child’s) similar experiences; b) people who thought of dyspraxia as an invented disorder with no validity. Although the article was about dyspraxia, it could equally well have been about developmental dyslexia, dyscalculia or dysphasia. These neurological labels are applied to children whose development is uneven, with selective deficits in the domains of literacy, mathematical skills, and oral language development respectively. They are often described as neurodevelopmental disorders, a category which can be extended to encompass attention deficit hyperactivity disorder (ADHD), and autistic disorder. Unlike conditions such as Down syndrome or Fragile X syndrome, these are all behaviourally defined conditions that can seldom be pinned down to a single cause. They are subject to frequent challenges as to their validity. ADHD, for instance, is sometimes described as a medical label for naughty children , and dyslexia as a middle-class excuse for a child’s stupidity. Autism is a particularly interesting case, where the challenges are most commonly made by individuals with autism themselves, who argue they are different rather than disordered. So, what does the science say? Are these valid disorders? I shall argue that these medical-sounding labels are in many respects misleading, but they nevertheless have served a purpose because they get developmental difficulties taken seriously. I’ll then discuss alternatives to medical labels and end with suggestions for a way forward. Parents often have a sense of relief at being told their child is dyslexic, as they feel it provides an explanation for the reading difficulties. Most people assume that dyslexia is a clearcut syndrome with a known medical cause, and that affected individuals can be clearly differentiated from other poor readers whose problems are due to poor teaching or low intelligence. In fact, that is not the case. Dyslexia, and the other conditions listed above, are all diagnosed on the basis of behavioural rather than neurological criteria. A typical definition of developmental dyslexia specifies that there is a mismatch between reading ability and other aspects of cognitive development, which can’t be explained by any physical cause (e.g. bad eyesight) or poor teaching. It follows that if you have a diagnosis of dyslexia, this is not an explanation for poor reading; rather it is a way of stating in summary form that your reading difficulties have no obvious explanation. But medicine progresses by first recognising clusters of symptoms and then identifying underlying causes for individuals with common patterns of deficits. So even if we don’t yet understand what the causes are, could there could be value in singling out individuals who meet criteria for dyslexia, and distinguishing them from other poor readers? To date, this approach has not been very effective. Forty years ago, an epidemiological study was conducted on the Isle of Wight: children were screened on an extensive battery of psychological and neurological measures. The researchers were particularly interested in whether poor readers who had a large discrepancy between IQ and reading ability had a distinctive clinical profile. Overall, there was no support for dyslexia as a distinct syndrome, and in 1976, Bill Yule concluded: “The era of applying the label 'dyslexic' is rapidly drawing to a close. The label has served its function in drawing attention to children who have great difficulty in mastering the arts of reading, writing and spelling, but its continued use invokes emotions which often prevent rational discussion and scientific investigation". (p 166). Subsequent research has focused on specifying what it is about reading that is so difficult for children who struggle with literacy, and it’s been shown that for most of them, a stumbling block is in the process of breaking words into sounds, so-called phonological awareness. However, poor phonological awareness is seen in poor readers of low IQ as well as in those with a mismatch between IQ and reading skill. What about if we look at underlying causes? It's an exciting period for research as new methods make it possible to study the neurological and genetic bases of these conditions. Many researchers in this field anticipated that once we could look at brain structure using magnetic resonance imaging, we would be able to identify ‘neural signatures’ for the different neurodevelopmental disorders. Despite frequent over-hyped reports of findings of ‘a brain scan to diagnose autism’ and so on, the reality is complicated. Similar arguments apply in the domain of genetics. If you are interested in the details, I have a blog explaining in more detail, but in brief, there are very few instances where a single genetic mutation can explain dyslexia, ADHD, autism and the rest. Genes play a role, and often an important one, in determining who is at risk for disorder, but it seems increasingly likely that the risk is determined by many genes acting together, each of which has a small effect in nudging the risk up or down. Furthermore, the effect of a given gene will depend on environmental factors, and the same gene may be implicated in more than one disorder. What this means is that research showing genetic influences on neurodevelopmental disorders does not translate into nice simple diagnostic genetic tests. To most people, medical labels imply distinct disorders with clear boundaries, but in practice, many individuals have multiple difficulties. 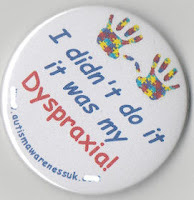 Maxine Frances Roper’s blogpost on dyspraxia illustrates this well: dyspraxia affects motor co-ordination, yet she described major problems with maths, which would indicate dyscalculia. Some of her commentators described cases where a diagnosis of dyspraxia was accompanied by a diagnosis of Asperger syndrome, a subtype of autistic disorder. In a textbook chapter on neurodevelopmental disorders, Michael Rutter and I argued that pure disorders, where just one domain of functioning is affected, are the exception rather than the rule. This is problematic for a diagnostic system that has distinct categories, because people will end up with multiple diagnoses. Even worse, the diagnosis may depend on which professional they see. I know of cases where the same child has been diagnosed as having dyslexia, dyspraxia, ADHD, and “autistic spectrum disorder” (a milder form of autism), depending on whether their child is seen by a psychologist, an occupational therapist, a paediatrician or a child psychiatrist. There has been much debate as to whether the causes of severe difficulties are different from causes of normal variation. The jury is still out, but we can say that if there are qualitative differences between children with these neurodevelopmental disorders and typically developing children, we have yet to find them. Twenty years ago, many of us expected that we might find single genes that caused SLI or autism, for instance, but although this sometimes occurs, it is quite exceptional. As noted above, we are usually instead dealing with complex causation from a mixture of multiple genetic and environmental causes. Robert Plomin and colleagues have argued, on the basis of such evidence, that ‘the abnormal is normal’ and that there are no disorders. Many people worry that if we say that a label like dyslexia is invalid, then we are denying that their child has real difficulties. This was brought home to me vividly when I was an editor of Journal of Child Psychology and Psychiatry. Keith Stanovich wrote a short piece for the journal putting forward arguments to the effect that there were no qualitative differences between poor readers of average or below average IQ, and therefore the construct of ‘dyslexia’ was invalid. This attracted a barrage of criticism from people who wrote in to complain that dyslexia was real, they worked with dyslexic children, and it was disgraceful for anyone to suggest that these children’s difficulties were fictional. Of course, that was not what Stanovich had said. Indeed, he was very explicit: “Whether or not there is such a thing as 'dyslexia', there most certainly are children who read markedly below their peers on appropriately comprehensive and standardized tests. In this most prosaic sense, poor readers obviously exist.” (p. 580). He was questioning whether we should distinguish dyslexic children from other poor readers, but not denying that there are children for whom reading is a major struggle. Exactly the same cycle of events followed a Channel 4 TV documentary, the Dyslexia Myth, which raised similar questions about the validity of singling out one subset of poor readers, the dyslexics, and giving them extra help and attention, when other poor readers, with very similar problems but lower IQs, were ignored. A huge amount of debate was generated, some of which featured in the Psychologist. Here again, those who had tried to make this case were attacked vehemently by people who thought they were denying the reality of children’s reading difficulties. Among those taking part in such debates are affected adults, many of whom will say ”People said I was stupid, but in reality I had undiagnosed dyslexia”. This is illuminating, as it stresses how the label has a big effect on people’s self-esteem. It seems that a label such as dyslexia is not viewed by most people as just a redescription of a person’s problems. It is seen as making them more real, emphasises that affected people are not unintelligent, and leads the condition to be taken more seriously than if we just say they have reading difficulties. Should we abandon medical labels? So what would the consequences be if we rejected medical labels? Here, it is fascinating to chart what has happened for different conditions, because different solutions have been adopted and we can compare and contrast the impact this has had. Let’s start with dyslexia. On the basis of the Isle of Wight study, Bill Yule and colleagues argued that we should abandon the term ‘developmental dyslexia’ and use instead the less loaded and more descriptive term ‘specific reading retardation’. Because of the negative connotations of ‘retardation’ their proposal did not take off, but the term ‘specific reading disability’ was adopted in some quarters. But, actually, neither term has really caught on. When I did a bibliometric survey of studies on neurodevelopmental disorders, I tried to include all possible diagnostic labels as search terms. I've just looked the frequency with which different terms were used to describe studies on developmental reading difficulties. Dyslexia won by a long margin, with over 97% of articles using this term. Quite the opposite happened, though, with ‘developmental dysphasia’, which was used in the 1960s to refer to difficulties in producing and understanding spoken language in a child of otherwise normal ability. This term was already going out of fashion in the UK and the USA in the 1970s, when I was doing my doctoral studies, and in my thesis I used ‘specific developmental language disorder’. Subsequently, ‘specific language impairment’ (SLI) became popular in the US research literature, but there is current concern that it implies that language is the only area of difficulty, when children often have additional problems. Among practitioners, there is even less agreement, largely because of an explicit rejection of a ‘medical model’ by the profession of speech and language therapy (speech-language pathology in the US and Australia). So instead of diagnostic labels practitioners use a variety of descriptive terminology, including ‘language difficulties’, ‘communication problems’, and, most recently in the UK ‘speech, language and communication needs’ (SLCN). [If you've never heard of any of these and want to see how they affect children's lives, see http://www.afasicengland.org.uk]. There do seem to be important negative consequences, however. As Gina Conti-Ramsden has argued , specific language impairment (or whatever else you want to call it) is a Cinderella subject. The amount of research funding directed to it is well below what you’d expect, given its frequency and severity, and it would seem that most members of the public have no idea what it is. Furthermore, if you say a child has ‘developmental dysphasia’, that sounds more serious and real than if you say they have ‘specific language impairment’. And to say they have language ‘difficulties’ or ‘needs’ implies to many people that those difficulties are fairly trivial. Interestingly, there also seems to be an implicit assumption that, if you don’t have a medical label, then biological factors are unimportant, and you are dealing with problems with purely social origins, such as poor parenting or teaching. An article by Alan Kamhi had a novel take on this issue. He argued that a good label had to have the properties of a meme. The concept of a meme was introduced by Richard Dawkins in the Selfish Gene, and subsequently developed by Susan Blackmore in her book The Meme Machine. A meme is an element of culture that is transmitted from person to person, and a successful meme has to be easy to understand, remember and communicate to others. Importantly, it does not necessarily have to be accurate or useful. Kamhi asked “Why is it more desirable to have dyslexia than to have a reading disability? Why does no one other than speech-language pathologists and related professionals seem to know what a language disorder is? Why is Asperger’s syndrome, a relatively new disorder, already familiar to many people?” (p. 105). Kamhi’s answer is that terms with ‘language’ in them are problematic because everyone thinks they know what language is, but their interpretations differ from those of the professionals. I think there is some truth in this, but there is more to it than that. In general, I’d argue, the medical-sounding terms are more successful memes than the descriptive terms because they convey a spurious sense of explanation, with foreign and medical-sounding labels lending some gravity to the situation. We are stuck between the proverbial rock and hard place. It seems that if we stick with medical-sounding labels for neurodevelopmental disorders, they are treated seriously and gain public recognition and research funding. Furthermore, they seem to be generally preferred by those who are affected by these conditions. However, we know these labels are misleading in implying that we are dealing with clearcut syndromes with a single known cause. So here’s a proposal that attempts to steer a course through this morass. We should use the term ‘neurodevelopmental disability’ as a generic term, and then add a descriptor to indicate the areas of major difficulty. Let me explain why each part of the term is useful. “Neurodevelopmental” indicates that the child’s difficulties have a constitutional basis. This is not the same as saying they can’t be changed, but it does move us away from the idea that these are some kind of social constructs with no biological basis. The evidence for a biological contributory causes is considerable for those conditions where there have been significant neurological and genetic investigations: dyslexia, SLI, autism and ADHD. I suggest ‘disability’ rather than ‘disorder’ in the hope this may be more acceptable to those who dislike dividing humanity into the disordered and normal. Disability has a specific meaning in the World Health Organization classification, which focuses on the functional consequences of an impairment for everyday life. People who are the focus of our interest are having difficulties functioning at home, work or school, and so ‘disability’ seems a reasonable term to use. It follows from what I’ve said above, that the boundary between disability and no disability is bound to be fuzzy: most problems fall on a scale of severity, and where you put the cutoff is arbitrary. But in this regard, neurodevelopmental disability is no different from many medical conditions. For instance, if we take a condition such as high blood pressure: there are some people whose blood pressure is so high that it is causing them major symptoms, and everyone would agree they have a disease. But other people may have elevated blood pressure and doctors will be concerned that this is putting health at risk, but where you actually draw the line and decide that treatment is needed is a difficult judgement, and may depend on presence of other risk factors. It’s common to define conditions such as dyslexia or SLI in terms of statistical cutoffs: the child is identified as having the condition if a score on a reading or language test is in the bottom 16% for their age. This is essentially arbitrary, but it is at least an objective and measurable criterion. However, test scores are just one component of diagnosis: a key factor is whether or not the individual is having difficulty in coping at home, work or school. ‘Neurodevelopmental disability’ alone could be used to indicate that the person has real difficulties that merit attention and support, but it lumps together a wide range of difficulties. That is no bad thing, however, given that many individuals have problems in several domains. The term would actively discourage the compartmentalised view of these different conditions, which leads to an unsatisfactory situation where, for instance, researchers in the US have difficulty doing research on the relationship between reading and language disabilities because these are seen as falling under the remit of different funding streams (NICHD and NIDCD respectively), or where a researcher who is studying language difficulties in autism will have much greater chance of obtaining funding (from NIMH) than one who is studying language difficulties in non-autistic children (which are far more common). Having defined our generic category, we need to add descriptors that specify weaknesses and strengths. Identification of areas of weakness is crucial both for ensuring access to appropriate services, and to make it possible to do research on individuals with common characteristics. Table 1 shows how traditional medical categories would map on to this system, with a downward arrow denoting a problem area, and = denoting no impairment. But this is just to illustrate how the system corresponds to what we already have: my radical proposal is that we could do away with the labels in the top row. A major advantage of this approach is that it would not force us to slot a person into one diagnostic category; rather it will encourage us to consider the whole gamut of developmental difficulties and document which apply in a given case. We know that many people with reading difficulties also have impairments in maths, oral language and/or attention: rather than giving the person a dyslexia label, which focuses on the reading difficulties, the full range of problem areas could be listed. Intelligence does not feature in the diagnostic definition of autism, yet it makes a big difference to a person’s functioning if intelligence is in the normal range, or above average. Further some people with autism have major problems with literacy, motor skills or attention, others do not. This framework would allow us to specify areas of weakness explicitly, rather than implying that everyone with a common diagnostic label is the same. Further, it would make it easier to document change in functioning over time, as different areas of difficulty emerge or resolve with age. In addition, a key feature of my proposed approach would be that assessment should also aim to discover any areas that parents or children themselves identify as areas of strength (up arrows), as fostering these can be as important as attempting to remediate areas of difficulty. If we take Maxine Frances Roper as an example, she evidently has good language and intelligence, so her profile would indicate this, together with weaknesses in maths and motor skills. In the past, the only area of strength that anyone seemed interested in was IQ test performance. Although this can be an important predictor of outcome, it is not all that matters, and to my mind should be treated just like the other domains of functioning: i.e., we note whether it is a weakness or strength, but do not rely on it to determine whether a child with a difficulty gains access to services. When we consider people’s strengths, these may not be in cognitive or academic skills. Consider, for example, Temple Grandin. She is a woman with autism who has become a highly respected consultant in animal husbandry because of her unusual ability to put herself in the mind of the animals she works with. Obviously, not every person will have an amazing talent, but most will have some activities that they enjoy and can succeed in. We should try and find out what these are, and ensure they are fostered. Although I see this approach as logical and able to overcome many of the problems associated with our current diagnostic systems, I’d be frankly amazed if it were adopted. For a start, it is complex and has resource implications. Few practitioners or researchers would have the time to do a comprehensive assessment of all the areas of functioning shown in Table 1. Nevertheless, many people would complain that this list is not long enough! What about memory, speech, spelling, executive function, or visuospatial skills, which are currently not represented but are studied by those interested in specific learning disabilities? The potential list of strengths is even more open-ended, and could encompass areas such as sports, music, craft and cookery activities, drama, ability to work with animals, mechanical aptitude and so on. I’d suggest, though, that the approach would be tractable if we think about this as a two-stage procedure. Initial screening would rely on parent and/or teacher and/or self report to identify areas of concern. Suitable well-validated screening instruments are already available in the domains of language, attention, and social impairment, and this approach could be extended. Areas identified as specific weaknesses could then be the focus of more detailed assessment by a relevant professional. The main reason I doubt my system would work is that too many people are attached to the existing labels. I’m sure many will feel that terms such as autism, ADHD, and dyslexia have served us well and there’s no need to abandon them. Professional groups may indeed be threatened by the idea of removing barriers between different developmental disorders. And could we lose more than we gain by ditching terminology that has served us well, as least for some disorders? I certainly don’t have all the answers, but I am hoping that by raising this issue, I’ll stimulate some debate. Various academics in the US and UK have been talking about the particularly dire situation of terminology surrounding speech and language disorders, but the issues are broader than this, and we need to hear the voices of those affected by different kinds of neurodevelopmental disabilities, as well as practitioners and researchers. With thanks to Courtenay Frazier Norbury and Gina Conti-Ramsden for comments on a draft of this post. More on failure of speech-language pathologists to agree on terminology for developmental language disorders. Kamhi, A. G. (2007). Thoughts and reflections on developmental language disorders. In A. G. Kamhi, J. J. Masterson & K. Apel (Eds. ), Clinical Decision Making in Developmental Language Disorders: Brookes. A recent Ofsted report, concluding that many children with 'special educational needs' are just poorly taught. Lindsay, G. (2011). The collection and analysis of data on children with speech, language and communication needs: The challenge to education and health services. Child Language Teaching & Therapy, 27(2), 135-150. Bishop, Dorothy V M (2014): What's in a name?. figshare. I found a link to this via Brainduck on Twitter. Thanks for a very interesting and insightful post, and for referencing my article. The idea of SpLDs being an umbrella rather than a set of rigidly separate conditions is one that crops up quite often in discussion circles, and instinctively I agree with it, as I expect many similarly well-informed/well-qualified people do. Certainly there seems to be compelling evidence around that people diagnosed with one SpLD will be more likely than the general population to have traits of the others. There is a caveat to that, I think, in that there are quite a lot of differences as well as overlaps in the presentation of SpLDs, so care has to be taken when grouping them together in order not to be just as misleading another way. Dyspraxia symptoms, for example, are often grouped with those of their better-known cousins, dyslexia and Aspergers Syndrome - good written and verbal communication skills are vital for the job I do and if a prospective employer sees "poor spelling" or "poor interpersonal skills" on a checklist of dyspraxia/SpLD symptoms, I'm done for. Similarly, there's a danger that if you list the symptoms of ALL SpLDs as one, they lose some of their "specific" nature and it looks as though someone is, to put it bluntly, incapable of anything. Sadly, as the split of comments on my article showed, there are certain people hard-wired to be nasty and dismissive of the vulnerable, and I don't think there is a scientific term or argument on earth powerful enough to convince them. In my case, it doesn't help that I'm a journalist/writer and we're largely perceived as pampered uncaring layabouts despite the fact that jobs in the field are extremely poorly paid and tough to come by, and that most of us are motivated by the enjoyment of writing and being around people, not the desire to intrude/annoy. But I'm prepared to put up with the obnoxious minority for the sake of awareness raising and yes, because I need the money. Thanks again for a very thoughtful and thorough post - I'll keep following your blog. For what it's worth, I can provide a comment from one of the user ends of such categories. I've been officially "dyslexic" since the age of 21 - end of the 2nd year of my undergrad degree. I like the idea of loosing those labels in favour of your 'gamut', though I wonder if it'd be possible/ sensible to sub-divide within them too...? Personally, I find the label dyslexia a bit of a bad fit - a bit tight in places, too baggy in others. I don't expect my dyslexic experience to be similar to others, at all. Indeed, one of the reasons my diagnosis happened relatively late was that I was so sceptical of a label which had always seemed a bit loose/ constraining. I remain sceptical of it. I should possibly also add, for context, that I have degrees in the social studies of science and education. So deconstructing the medicalistaion end of this is something I'm quite familiar with (n.b. this is not the same as not believing or enjoying the science in any way). The labeling of dyslexic has been useful to me in many ways though. Emotionally I suppose it helped, in ways you allude to above (though I did remain pretty sceptical of it, and thought a lot about it while studying sociology of science and education... I admit I might be a bit weird as a case study here). Where it is most useful is in a very instrumental way, as I use it to communicate quickly and clearly that there are things I have trouble with. I don't especially like using it in that way, partly because I feel its a bit of a wrong fit for whatever it is that is going on with the way I think. However, I do find I need some sort of statement (not quite the bade you have as illustration, but a bit...) if I don't want people to call me stupid/ provide me with forms I find hard to fill in, lists of numbers I'm expected to hold in my mind, etc. I'm also very aware of friends' problems with other tasks which can't so easily be labeled. Personally, I'd rather we were all just more accepting of the sorts of differences tags like dyslexia aim to capture. One way of putting this is that I'd rather live in a society where my "dyslexia" simply isn't a problem (that doesn't mean we shouldn't study these things, but labeling takes on different role in it's social use). But we don't. That said, the other reason my diagnosis was so late was that up until I took my final A-level exam (or more specifically, the day one of them was marked) the dyslexia wasn't a problem. One of the advantages of an education from a inner city comp is they tend to be able to deal with diversity. That bits of society can manage, so maybe there is hope. As well as social acceptance, the diagnosis gave me personal understanding. However, I'd say that all of these forms of understanding were all quite specific, and in many ways the label 'dyslexia' was surplus to requirements. The process of talking to experts on the topic and confronting my own learning differences subjectively and thoughtfully (as opposed to ignoring/ masking them or simply writing myself off as dumb) was incredibly useful, but I don't think I needed the D-word for that. I can't but agree. The whole DSM (and similar) should have been scrapped and rewritten from scratch. It's mostly a collection of erronous diagnosis expanded upon by confirmation papers. Funny i just posted on the Autism board about this before reading. It must be in the air. I would like to have this article widely discussed in the US. I am not enough of a legal scholar to understand how your proposal would interleave with the Individuals with Disabilities Education Act (IDEA) (which covers access to education from birth until the child graduates from secondary school or "ages out" at 21 or 22) and the Americans with Disabilities Act (ADA) which confers some educational rights to students with disabilities. However my sense is that legal definitions & decisions have a lot to do with the "situation on the ground" -- in the classroom, that is. Alice: the social acceptance bit is important, and I hope would emerge if we thought more of identifying and fostering children's strengths as well as weaknesses. But! many children with these disabilities have huge problems, e.g. with reading ability too poor to access much of the curriculum, and they need to be identified so that they can get support. So I think we won't ever get away from need for labels. Thanks Liz! We have similar issues in UK but I think not so formalised and much geographical variation. It also has implications for whether or not children/students get extra time in exams: some 'disabilities' are more recognised than others. In adulthood, I've had people tell me they would prefer to be called autistic (rather than language impaired) because there are services for people with autism, and also employers will take on someone with that diagnosis because they count towards a quota of employees with disability. Developmental language disabilities in adulthood go completely unrecognised and uncatered for. Anyhow, please keep comments coming in. We need a lot of brainpower exploring the pros and cons of different approaches if we are going to arrive at a useful solution. Lehrer, like Gould in his book The Mismeasure of Man, has done a service by pointing out that scientists are humans after all, and that their drive for reputation—and other nonscientific issues—can affect what they produce or perceive as “truth.” But it’s a mistake to imply that all scientific truth is simply a choice among explanations that aren’t very well supported. We must remember that scientific “truth” means “the best provisional explanation, but one so compelling that you’d have to be a fool not to accept it.” Truth, then, while always provisional, is not necessarily evanescent. To the degree that Lehrer implies otherwise, his article is deeply damaging to science. Great article Deevybee, I'd be really interesting in seeing a review of research in to the direct effects on children labelled with developmental disorders - but yes it seems to be a very hard area to research ethically and an even harder one to change. Thank you for a very interesting piece on terminology in developmental disorders. I liked the idea of describing such disorders as ‘neurodevelopmental’ because this perfectly catches their nature and origin in general terms, and the addition of the term 'disability' could be useful in attracting resources via the legislation surrounding the ‘Disability Discrimination Act’ (as opposed to the lack of resources that typically followed ‘SEN’ - special educational needs). But when you add the suffix “Reading, Maths, Attention etc” this really becomes a bit of a mouthful. Currently in our professional reports we tend to make conclusions along the lines of “ X has a [specific] learning difficulty consistent with dyslexia with/in the context of... (language/attention/other problems) but the common response from parents is 'but is s/he dyslexic?'. And this is because they (and teachers too) often see a diagnosis as the first step to intervention. So where do I stand? Well quite split really! As a researcher, I am all too aware of the co-occurrences between disorders, as well as the ways they change over time. So of course I am on the side of thinking in dimensional rather than categorical terms about disorders http://www.amazon.co.uk/Developmental-Disorders-Language-Learning-Cognition/dp/0631206124/ref=sr_1_2?ie=UTF8&qid=1293191436&sr=8-2 . However, as someone who grew up with dyslexia in the family, I also like labels – they communicate patterns of difficulty quite explicitly and lead to prescriptions for intervention; without them children and young people would be lost in our education system, and certainly they mean a lot to people with, for example, dyslexia or dyspraxia, who otherwise can be labelled stupid or lazy. Can we have both I wonder? Well this is really what Sir Jim Rose’s report on ‘dyslexia published in 2009 attempted ‘Identifying and Teaching Children and Young People with Dyslexia and Literacy Difficulties’ http://www.dcsf.gov.uk/jimroseanddyslexia/. In this report, the expert group proposed that the core features of dyslexia (based on empirical research findings) can be identified and intervention follows from them – rather than from a ‘diagnosis’; however, it also recommended that the term ‘dyslexia’ is useful for labelling literacy difficulties when these are severe and persistent, bringing to the fore the need for monitoring of response to intervention. I don’t see why this could not be done for other neurodevelopmental disabilities: if they persist and are resistant to ‘well-founded’ intervention then they need a label which provides an explanation for the affected individual, their family and society. In this regard, I agree we do need to find a way of neuro-labelling ‘specific language impairment’ if it is to attract the recognition and resourcing, and this will require attention to heterogeneity. In summary, Bishop’s blog lays out an important agenda for research, policy and practice. As professionals we need to be able to draw on an evidence-base that will allow us (i) to know precisely what the core features of each disorder are (ii) to know what interventions are effective for each disorder. From this evidence-base, we need to be responsibility for conveying to parents and other professionals (iii) the nature of the primary difficulty the child is currently experiencing (iv) that there may be complicating/co-occurring conditions which in due course could require attention and finally we must ensure (v) that our assessments are comprehensive and (vi) that we regularly monitor response to intervention. Hi Dorothy. Great post and great comments. I don't have a huge amount to add. My feeling is that labels are here to stay and in many respects are useful (eg in terms of accessing services, public understanding etc). But from a research point of view, we definitely need to recognise that many of the category boundaries are somewhat artificial and move towards your neurodevelopmental disability model. Judging by recent reviews of grants and papers I've had, even this isn't going to be easy. I'd also be interested in your thoughts on the removal of Asperger syndrome from DSM V. From a research point of view, I don't think the distinction between Asperger syndrome and autism is particularly helpful and removing the artificial category boundary is a good thing. But Asperger's has definitely achieved the status of cultural meme, so I don't think it's going to disappear any time soon (and don't see any reason why it should). It'll be interesting to see how it all pans out. Hopefully, we'll end up with a situation like you envisage where people are diagnosed in a broad 'autism' category but with evaluation of individual strengths and weaknesses (and recognition that those can change with development). I think everyone will find Hugo Kerr's comments well worth a read. I agree with most of what you suggested. It's incumbent upon all clinicians working with developmental disorders to know about ALL of them, not just that/those that correspond most closely to their 'field'. Otherwise we get many men/women with hammers! A healthy understanding of ODD and behaviour theory wold also help. We use a bastardised Venn diagram to explain the overlap between the developmental disorders. I can't paste it in to this post but you can imagine (from L-R) Intellectual impairment(s) overlapping with autism, autism overlapping with ADHD (but this is not a bi-directional relationship as autism is no more common in ADHD than in the general population), ADHD overlapping with dyslexia, dysgraphia (if you choose to separate the two) and maths weaknesses. Motor weaknesses (DCD in DSM terms) and oral language problems overlap all the other conditions. We might use a version of your table from now on as it is less messy. This approach not only gets new psychs/SLPs out of the DSM mode that they acquire from university but helps with hypothesis testing during assessment. For example, if a referral questions seems to be about attention or the clinical interview seems to point this way we know that we need to be asking questions about and testing for dyslexia, motor issues, oral language etc. Your argument seems to mirror the tension that exists between many in psychology and psychiatry in choosing between an idiographic vs nomothetic approach to diagnosis/case formulation. Many psychiatrists like to use nomothetic diagnosis (using DSM; e.g., you have depression) whereas a good psychologist might say "thanks but so what", the label doesn't help us treat because we know nothing about predisposing, triggering, maintaining factors etc. Only when one has all that information can one treat properly. You are obviously favouring an idiographic approach which is more about description than discrete diagnosis. I couldn't agree more. However, like you I am not confident that such an approach would fly for several reasons. First, the existing labels are powerful memes. Second, many clinicians make a good living doing what they do now thank you very much. Third, many clinicians are unethical enough not to read the literature and if they do many don't have the capacity or will to critically evaluate it (perhaps hence the power of memes). Fourth, an idiographic approach would be challenging for funding bodies (US managed care, ed departments). I have often said that I would love PDD NOS to be scrapped from DSM and for there to be a general Developmental Disorder category that allowed us to add modifiers (as already occurs for other disorders in DSM) to describe the problem more completely. And then I woke up! Wow - this is all really good reading! I'm a class teacher with a particular interest in children with special needs, currently working 1:1 with children with reading difficulties. I've also previously done a fair bit of work with children on the autistic spectrum (and with an Asperger diagnosis in the family - and several other members with many 'traits'). This all makes so much sense (and really fits with how I think). The 'memes' bit is particularly interesting. Thank you to all, it has helped me to clarify things for myself. sorry for the 'anonymous' tag - not sure what all the others were. I am sitting at a crossroads. I did read the blogpost and some of the comments you alluded to at the beginning of your post. Am I doing him any favors by not allowing him to make his own way with the gifts he has? None of us are abled in all areas. Giving adaptions/accomodations to a great degree in academics (because they are so bright) seems the right thing to do, but does it keep them from discovering their true vocation? So far, we haven't told anyone. I'm sure his tech school teachers are familiar enough with all kinds of minds that they will give him what he needs if it makes sense to do so. Then again, I've never been much of a fighter about his "rights". I've always had faith he would find his way. We have done the best we could (his teachers, family) and now it's up to him, to find what he is able to do, just as all of us do. I'm 54, and still don't know what I want to be when I grow up. Hopefully, he'll do better. You see, it doesn't matter what anyone thinks of him, but what he thinks of himself. Sorry, not very "sciency". My son could have a check in every box of the new labelling system you propose...sincerely, I'm not kidding. If he can make it, it will show the depth of his spirit to be an overcomer. What I want to reiterate is that we are at a crossroads, and we have chosen for a time to try it without the label of autism he had for 9 years of public schooling, with 6 years of OT and Speech therapy. For a time, we are putting trust in his teachers, and praying that he has what it takes to move forward in his own time. If I had any reason to have a true say, I prefer your system because it allows for the mix that is so obvious among kids. My son was labeled Autistic, but his severe dysgraphia and dyscalculia were the factors that made school, and will probably make life, more difficult than most of his classmates. They weren't considered...it was autism (BD) all the way. Thanks for the interesting post. There's a tension over labelling within the autistic community itself and much disussion of the usefulness/divisiveness of commonly used labels. I'm not sure where I fit in or what I should call myself. It was very useful to get a diagnosis of Aspergers as an adult as it gives me some legal protection and it explains how and why I got here. But am I an autistic traitor if I call myself Aspergers rather than autistic? Am I benefitting from that more socially acceptable label? Or should I stand up as autistic and proud, and have an intrinsic duty to raise awareness of autism as a whole. I'm not sure. I'm tending towards the 'solidarity of the autistics' at the moment! I also have ADHD which is a whole other problem as labelling as a lot of people don't believe in it. Thanks for your comment. The one thing I am learning through this debate is that deciding on appropriate labels is not just a matter for science. There are huge social consequences, both in terms of how society responds, but also in terms of how labels affect people's self-perception. It's interesting to me that there are some labels, such as Deaf, dyslexic or autistic, that can identify people as belonging to a particular community and instil a sense of belonging and pride. Other labels, such as specific language impairment, learning disabled, dyspraxic, etc don't come across that way and just seem entirely negative. Re your situation - I see Asperger's and autistic as two different ways of referring to a pattern of behaviours, and don't see any reason why you should not be comfortable using both, depending on the situation and the level of knowledge of the people you are talking to. As a 17 year old teenager my son was tested at school as potentially suffering from "dyslexia" - he had shown some reluctance/problems with reading long dense texts. His scores included a very high IQ (top 1%) and "slow processing". Subsequently, exposed to the study stresses at university this characteristic manifested itself in over concentration on detail, perfectionism and increasing bouts of anger. He graduated from university but insists that he is not fitted for life. I am unsure if identifying something like "slow processing" without hope of relief or mitigation is not helpful in coping with life.